The Libraries can now offer mobile services (chat, email, etc) from the Ask-a-Librarian app; it is available from Amazon, Google Play and iTunes. 2. Or search for LSU. You will find links for both Reference and the Dental Library. Thanks to the School of Medicine Office of Student Technology, LSUHSC now has access to a new web-based clinical application designed to aid in visual diagnosis and patient education. VisualDx?á allows point-of-care assistance for the user. The differential builder, diagnosis search, and medication search provide the information necessary to compare symptoms, visual cues, diagnosis, and treatment options. The VisualDx image bank contains over 25,000 medical images of diseases of the skin, hair, nails, eyes, lungs, etc. and shows variations by age, skin type, and stage. You can watch a video overview of the application here:?áhttp://www.visualdx.com/features/video-overview. Access to VisualDx is currently available through August 2014 for use on campus as well as off-campus for those with remote access privileges. ?áSupported browsers are Internet Explorer 7+, Google Chrome, Firefox, and Safari. VisualDx also supports mobile wireless devices with a 3G or 4G connection. Tags: Databases, Education-technology, mobile, Remote Access | Emergency Medicine, Family Medicine, Infectious Diseases, Library News, Medicine, Off-Campus Access, Pediatrics, Tools | Permalink | Comments Off on Introducing VisualDx: A New Tool for Clinicians | Posted Friday, November 15, 2013 by Phillips, Holland T.
The Library has a new mobile website. You can access the site through the “Mobile Isch?®” link on the homepage. 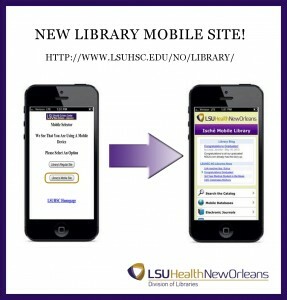 When you go to the homepage (http://www.lsuhsc.edu/no/library)?áon any mobile device, a screen will prompt you to select the Library Mobile Site. The site includes access to the library catalog (INNOPAC), some of our most popular databases in mobile format, electronic journals, research guides, the web chat with a librarian service, library hours, contact information, locations, and frequently asked questions. 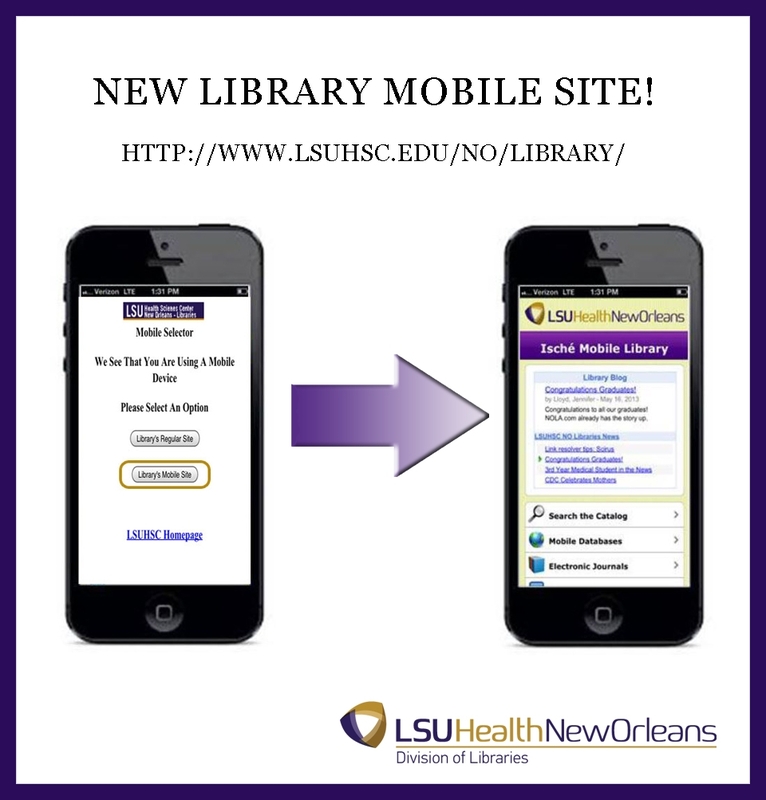 If you have any feedback about the mobile site, please e-mail jbroo8@lsuhsc.edu. Tags: mobile | E-Resource News, Library News, Mobile Resources | Permalink | Comments Off on New Library Mobile Site! | Posted Wednesday, June 12, 2013 by Brooks, Jessica P.
BiteSizeBio blog has a new post on Android apps for scientists. From timers to tables to Twitter, if you use and Android device and spend time in the lab, you might find these useful. We are looking for two Android staff writers to join the iMedicalApps team! You need to be a medical professional with strong writing skills and be able to contribute on a weekly basis. We offer monthly payment plans. School of Medicine’s ?áfirst Senior & Junior block of the year for the began on Monday, July 9th. Before you head off on clinical rotations, download these free clinical apps ?áand feel a little more prepared. For the previous apps, download the free?áSkyScape?áapp on your phone, then insert your serial numbers from the library in Skyscape’s settings to download & access the resource. Micromedex -?áMicromedex has 3 apps available for Android and Apple. Micromedex?« Drug Information app?áis free for anyone and offers over 4500 drug search terms. Micromedex?« Drug Interactions is a free-to-LSUHSC app requiring a quarterly password. You can find the password on our MicroMedex page under mobileMicromedex or email reference@lsuhsc.edu?áand we can send it to you. This app provides insight into: ?áwhy the drugs in question interact, how the results of those interactions will present in the patient and recommendations for monitoring patient outcomes. To find and install Micromedex apps, search for Micromedex in your smartphone’s app store. ?áYou can find the quarerly password via our MicroMedex page under?ámobileMicromedex,?áor email?áreference@lsuhsc.edu?áand we can send it to you. Find more mobile apps on our Mobile LibGuide. Just in time for medical internships to begin July 1st, iMedicalApps.com ?áhas released a curated list of top 10 free iPad medical apps. Resources include AHRQ’S EPSS, MicroMedex, and MedScape. Notoriously missing is Epocrates.com. Why? Turns out they don’t even have a native app for iPad. Online textbook provider Stat!Ref has just released an iPhone & Blackberry app, so you can read books on your phone. ?áCheck out the video below for how to enable access. Android app is coming soon. 2 Minute tips?áis a blog series where we bring you short video tutorials on various tools and resources in the library. Review by Jakob Nielsen, usability expert. Summary: Mobile web sites work best on the 7-inch tablet. Users had great trouble touching the correct items on full sites, where UI elements are too small on the Fire screen. Review by Susan Smith, librarian at Lister Hill Library, Univ. of Alabama – Birmingham. Advanced Cardiovascular Life Support (ACLS) refers to a set of clinical interventions for the urgent treatment of cardiac arrest and other life threatening medical emergencies, as well as the knowledge and skills to deploy those interventions. Certification is a requirement for medical students as well as other health care providers like paramedics, nurses, respiratory therapists, clinical pharmacists, physician assistants, and nurse practitioners. The ACLS Review App by Limmer Creative offers high-quality quizzes based on the current AHA guidelines for the review of ACLS algorithms, representing a valuable resource for healthcare professionals ÔÇôincluding paramedics, medical students, physicians, and nursesÔÇô looking to master and/or acquire certification in ACLS. Once certified, this app also represents a great refresher, but we also recommend users complement this app with iResus for assistance when practicing or executing ACLS algorithms. While definitely not a replacement for proper ACLS training and certification, we highly recommend downloading the app and familiarizing oneself with it for potential use in such situations. It’s free, so why not download yourself and see? Renewing is simple. Just email reference@lsuhsc.edu or call 504-568-6100 to request a new serial number and then enter it into the app on your phone. Embryo is new app for iPhone, iPod Touch and the iPad from the NLM. This app provides a collection of digital serial sections of early stage human embryos for mobile devices. Features include human fertilization videos, photo micrographs of early-stage embryo development, 2D and 3D digital images using visual stack dissections, and a pregnancy calculator. Embryo is especially cool because LSUHSC-NO scientists were involved in it’s creation. The app is a collaborative project between the NLM, the Eunice Kennedy Shriver National Institute of Child Health & Human Development (NICHD), the Virtual Human Embryo Project at LSUHSC-NO and the National Museum of Health & MedicineÔÇÖs Human Developmental Anatomy Center. The Virtual Human Embryo Project was developed in the early 2000’s as a collaboration between embryologist Dr. Raymond Gasser at LSUHSC and the Human Developmental Anatomy Center in Washington DC. Dr. John Cork at LSUHSC joined the project at its inception as the software developer with a special interest in 3D-reconstruction. The images generated from the earlier project provide the basis for Embryo. More information and screenshots from iTunes. 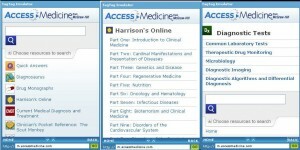 AccessMedicine, the popular resource that includes the full text of Harrison’s Online, diagnostic tests, and much more is now optimized for your mobile device! To log in, go to m.accessmedicine.com on your mobile browser and log in with your MyAccessMedicine user name and password. Don’t have a MyAccessMedicine user name and password? You can create one through the Access Medicine homepage. 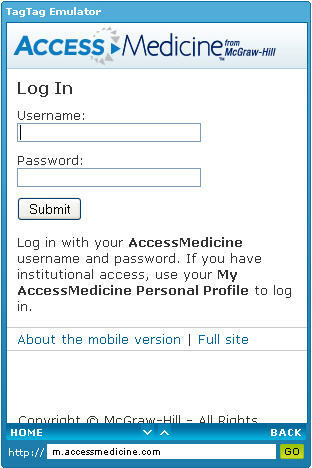 Simply select “MyAccessMedicine” on the right side of the screen and follow the directions. Natural Standard, an online database with evidence-based information about complementary and alternative therapies, has redesigned their website. Natural Standard offers a variety of tools, including graded analysis reflecting the level of available scientific data for or against the use of therapies for a specific medical conditions, a symptom checker/differential diagnosis tool, medical calculators and patient handouts. “Bottom line” analyses offer succinct summaries on public health topics, genomics & proteomics, sports medicine and medical conditions. A mobile version is available via Skyscape.com for most devices. It is free for LSUHSC students, faculty and staff. It offers consolidated information on effectiveness, side effects, interactions, dosing, pregnancy, breastfeeding, historic background, practitioner accreditation, theory, and safety on a variety of drugs and natural therapies. Email mknapp@lsuhsc.edu for a serial number and installation directions. Natural Standard can be found under Online Resources – N on the library homepage. It is available on and off campus.